Virologists, start your poliovirus destruction! 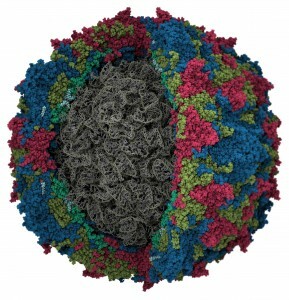 I have worked on poliovirus for over thirty-six years, first as a posdoctoral fellow with David Baltimore in 1979, and then in my laboratory at Columbia University. The end of that research commences this year with the destruction of my stocks of polioviruses. In 2015 there were 70 reported cases of poliomyelitis caused by wild type 1 poliovirus, and 26 cases of poliomyelitis caused by circulating vaccine derived polioviruses (cVDPV) types 1 and 2. The last case of type 2 poliovirus occurred in India in 1999, and the virus was declared eradicated in 2015. Consequently the World Health Organization has decided that all remaining stocks of wild type 2 poliovirus should be destroyed by the end of 2015. My laboratory has worked extensively with type 2 polioviruses. Before we produced transgenic mice susceptible to poliovirus, we had studied the Lansing strain of type 2 poliovirus because it had the unusual ability to infect wild type mice (polioviruses normally only infect certain primates). We determined the nucleotide sequence of the viral genome, identified the capsid as a determinant of the ability of the virus to infect wild type mice, and showed that swapping an eight amino acid sequence of capsid protein VP1 from a type 1 strain with that from Lansing conferred the ability to infect non-transgenic mice. These findings indicate that the ability of the Lansing strain of poliovirus to infect mice is likely due to recognition by the viral capsid of a receptor in the mouse central nervous system. In the past year we took advantage of the ability to produce mouse neurons from stem cells to attempt to identify the murine cellular receptor for Lansing virus. To prevent further cases of poliomyelitis caused by cVDPVs, WHO has decided that there will be a synchronized, global switch from trivalent OPV to bivalent OPV in April 2016. By July of 2016 all remaining stocks of the Sabin type 2 poliovirus strains, which are used to produce OPV, will also be destroyed. No wild type 3 poliovirus has been detected since November 2012, and it is likely that this virus will be declared eradicated within the next several years. At that time we will have to destroy our stocks of type 3 poliovirus. That leaves wild poliovirus type 1, which circulates only in Pakistan and Afghanistan. Given the small number of cases of paralysis caused by this type, it is reasonable to believe that eradication will occur within the next five years. If this timeline is correct, it means that I will be destroying my last vials of poliovirus around 2020. It is of course necessary to destroy stocks of wild and vaccine polioviruses to prevent reintroduction of the virus and the disease that it causes. The 1978 release of smallpox virus from a laboratory in the United Kingdom, which caused one death, lead to requests for reducing the number of laboratories that retained the virus. Today there are just two official repositories of smallpox virus in the United States and Russia. It is rare for an investigator to be told to destroy stocks of the virus that is the subject of his or her research. Over the years we have published 81 papers on poliovirus replication, vaccines, and pathogenesis. While I realize that it is absolutely essential to stop working on this virus, I do so with a certain amount of sadness. What other emotion could I have for a virus on which I have expended so much thought and effort? Correction: The synchronized switch in April 2016 is from trivalent to bivalent OPV, not OPV to IPV. Consequently I have removed comments related to an OPV-IPV switch. Dear Vincent, Congratulations by words, bravery, courage. Destroy of the your stoks virus do not be easy. I desire strength in this task and I am a big fan of your work!!! You helped eradicate a human disease. That is a very big deal! Thanks. Few people can have ever been in such an enviable position to know that their lives have been so well spent! Congratulations , and many thanks to you, and the generations of careful researchers who brought humanity to this happy point. thanks to you and hope you to success in your big efforts . Perhaps the end of paragraph 2 (“…should be destroyed by the end of 2015”), should read “…by the end of 2016”. It’s actually 2015 according to WHO. Clearly the US is behind schedule! I hope this doesn’t negatively affect any of your students’ work! Absolutely, I couldn’t have phrased it better. My last two PhD students are done. However my Research Scientist was working on a type 2 project which we will have to stop. First Congratulations for the great success.Second i do not agree so far to destroy stocks of the virus is concerned i believe what appears to be the end may really be a new beginning. Previous post: Trial By Error, Continued: Did the PACE Trial Really Prove that Graded Exercise Is Safe?